Ukraine features 86 national parks, each unique in its own right and characterised by different flora, fauna, landscapes and water resources. However, visitors often miss the key attractions of these parks because they do not know what to look out for or are not aware of what each park has to offer in particular. Therefore, a new logo has been created that indicates all these key features. In order to realise such a logo, one that everyone can relate to and which gives each park its own identity under the same graphic umbrella, a set of elements was created to represent the natural features within each park, including a waterfall, a fountain, a canyon or a swamp. As a matter of fact, a graphic look that all Ukrainians immediately understand is their iconic traditional embroidery, which in an abstract way reflects nature as the fabric of all its elements. Each park’s logo is therefore composed of the individual natural characteristics of that park to acquire a unique appearance. Looking at a park’s logo is thus almost as if looking into that park itself. 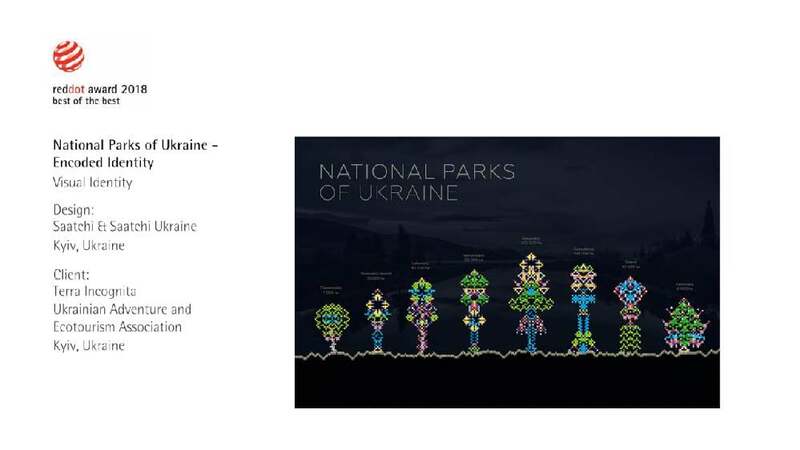 The idea of using embroidery designs in creating a visual identity for the 86 Ukrainian national parks is absolutely outstanding. The identity has thus emerged as a graphic superstructure that is immediately familiar to every fellow countryman and countrywoman. Comprising recognisable logos, icons and pictograms, it has an appearance that allows for highly versatile application and which is just as functionally convincing as it is aesthetically pleasing.